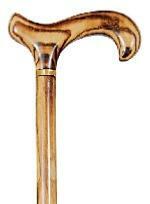 A very elegant and eye-catching derby cane. The ash wood has had its bark removed, then reduced to produce an elegant tapered shape. The wood is then flame-scorched to bring out the beauty of the grain, before being polished to a beautiful shine. Fitted with a smart brass collar and metal ferrule, the cane is 92cm (36"). Ferrule diameter 19mm. Classic Canes is on Facebook and Instagram. Please follow us for the latest new product information and other walking stick news.